Brian Deane celebrates his fourth goal against QPR in 2004 with David Healy. It’s not unusual for a Leeds United fan to have some explaining to do when they stumble in from a day at the match. But explaining a 6-1 win after a run of five defeats in six, in which a 36-year-old Brian Deane scored four goals including a first-half hat-trick? Good luck. Brian Deane heads in his fourth goal against QPR in 2004. That’s exactly what happened 14 years ago tomorrow, though, when chants of “Deano for England” whistled through the half-time concourses. Queens Park Rangers were the guests and arrived in good spirits, riding high in the Championship play-off places and fresh from an important win against fellow promotion-chasers Wigan Athletic. They left, presumably, as confused as everybody else. Leeds had made a slow start under new boss Kevin Blackwell, his new-look side had taken some bedding-in as they occupied the lower reaches of the Championship table. So it surprised no-one that QPR took the lead inside two minutes with a stunning strike from Gareth Ainsworth. Brian Deane scores his second goal against QPR in 2004. That they did, kicking into gear with a whirlwind display of fast, direct, driven football that the Londoners couldn’t cope with. Northern Irish international David Healy struck back for the home side with an exquisite finish over the head of QPR keeper Chris Day on nine minutes. Enter Deane. His first goal was bundled in at the back post before Jermaine Wright sent Elland Road into raptures with a well-taken goal to make it 3-1 on 23 minutes. Shell-shocked, QPR failed to get a foothold in the half and Deane continued to find himself in the right place at the right time, completing a sensational hat-trick with two goals on the stroke of the break. Leeds United went in 5-1 up. “I remember a little bit of good play from John Oster for one of my goals and some good work from Jermaine Wright as well for another, and it was just a case of getting in front of my defender for two or three of them,” Deane said. “They were straightforward goals, if I’m honest, and I didn’t have to do much – but you take them. 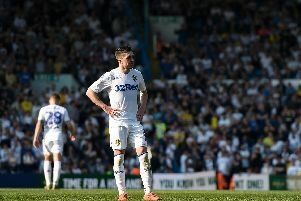 With the Whites hissing and QPR sullen, Leeds fans dared to dream of a monstruous final score, as it happened, they’d have to make do with six as Deane finished the rout in the 72nd minute. “It was a definite high and the pick-out moment in every way of my second time around at Leeds,” he said. “I remember going home from the match absolutely buzzing in every way – like I was a 12-year-old kid! Leeds United: Sullivan, Kelly, Carlisle, Butler, Pugh, Walton (Richardson 90), Gregan, Wright, Oster, Deane (Lennon 86), Healy (Joachim 77). Subs not used: Carson, Kilgallon. QPR: Day, Bignot, Shittu, Santos, Rose (Padula 11), Ainsworth, Bircham, Gallen, McLeod (Cook 45), Furlong, Cureton (Bean 45). Subs not used: Branco, Miller. Referee: C Webster (Tyne & Wear).